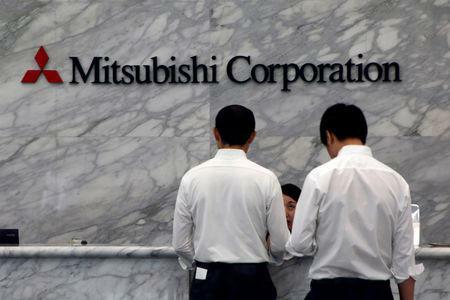 TOKYO (Reuters) - Japan's biggest trading house Mitsubishi Corp on Tuesday posted a 6 percent rise in its April-December net profit thanks to higher income from energy operations, and stuck to its record profit forecast for the year despite one-off losses. Mitsubishi's net profit grew to a record 442 billion yen ($4 billion) for the nine months to Dec. 31 from 416 billion yen a year ago. The company booked an impairment loss of 28 billion yen on its stake in Singapore's Olam International and 31 billion yen on its investment in iron ore mines in Chile in the October-December quarter, but it kept its forecast of a record 640 billion yen profit for the year ending March. "We have paid a premium for Olam as we had expected synergy with our operations, but the outcome has missed our target," Mitsubishi Chief Financial Officer Kazuyuki Masu told a news conference. As for the Chilean mines, Mitsubishi took the loss due to an extra environmental cost to build a tailing dam mainly for the Los Colorados mine, which produced 14 million tonnes of iron ore in 2018, and a repair cost for a broken shiploader at a port. The port's loading operation has been stopped since the collapse of the shiploader in November, Masu said. The mines are 25 percent owned by Mitsubishi and 75 percent by Chilean iron ore and steel producer CAP SA, according to a Mitsubishi spokesman. Mitsubishi's annual profit prediction missed the 655 billion yen mean forecast in a poll of 9 analysts, according to Refinitiv. Japanese trading companies have benefited from higher prices for commodities such as oil and coal, while their results also reflect healthy earnings in non-resource segments which they have strengthened since the last commodities down-cycle.